And apparently punctuation is necessary only at the end of the paragraph and not after a sentence that might conclude somewhere in that paragraph. It has been a while since I pointed out a business' or government's improper use or mutilation of the English language on public signage. I never mentioned on The Offlede the time a local McDonald's announced that its McCafe coffee drinks were "comming" soon. Or the many instances in which a flashing construction sign kept changing the way "periodic" - as in periodic delays - was misspelled ... a different way each time. Pereodic. Perodic. Peridoc. You name it. Never could get it quite right. As a copy editor, I criticize such things that pop up in everyday life. There's a figurative red pen in my mind that I can't seem to cap. I do it when I watch TV, when I read books, when I order food. Even when I hear people talk. If you say "further" when you mean "farther" when talking about your jog this morning, I will make a mental red scribble on your speech. If your slipup is egregious enough and if I feel priggish enough, I might even correct you with my own speech. It's a consuming, yet instinctive activity. And one would think that such an uncapped red pen would eventually dry up, that I'd get tired of it. Not yet. The sign - typo and all - likely has stood in its position for a good period of time, at least since the last major hurricane, in 2004. A plus side to the next major hurricane would be that signs such as this one would be endangered, possibly ripped up and never found again (unless it somehow makes its way into my personal collection of ridiculous public signs). In my expert legal opinion - I minored in law at the prestigious University of Maine - the error makes any contract between the erratic golfer and the golf course null and void. Such a misspelling makes it unconscionable. But it's plausible that the city of Melbourne, which owns Mallards Landing Golf Course off Lake Washington Road, couldn't justify paying for a new sign - especially now that we're in a recession and all the excuses that come with economic hard times. But there are questions that were raised as to why it hasn't been fixed or replaced. 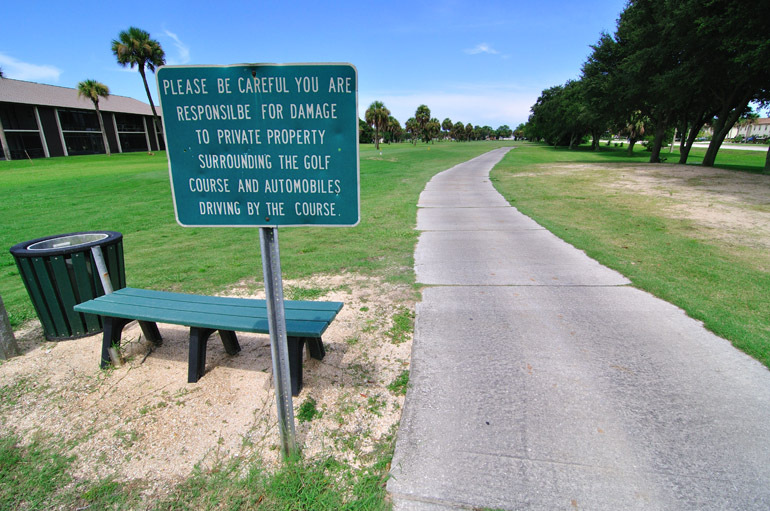 First, if a contractor created the sign, why wasn't the typo pointed out and corrected before it was put into place on the course? This stuff should come with a warranty. Or were its municipal recipients simply too cranially deficient to pick up on such an error? Secondly, if a jailbird fashioned the sign, why not just scrap the inmate work program completely? It's unarguable that criminals need more education. They wouldn't have gotten caught if they weren't stupid. So why not just keep them locked up and let them read books for their entire sentence? In the long run, 364 days of solid book learnin' might be the best option for society as a whole. Maybe then, such mistakes won't be made, and they will be prevented from ever polluting brains with misspelled words and nonexistent punctuation. I want to know who is responsible for this sign so that he or she can repair any intellectual damage it may have caused to me and to my fellow athletes. And be brought to justice by my red pen.